How Safe Is Coca-Cola's Dividend? The telecom giant has a long history of strong dividends, but will rising competition threaten its future? Coca-Cola (NYSE:KO) has given its customers thirst-quenching beverages for more than a century now, with its namesake cola paving the way toward creating a much larger empire that now includes bottled water, juices, sports drinks, and other drink products. For dividend investors, Coca-Cola has been a strong performer, building up a track record for regular dividend increases and safe, sustainable payouts. With recent controversy, however, some investors worry that Coca-Cola might run into trouble ahead. By looking at Coca-Cola's fundamental business prospects, you can see whether it's smart to rely on its dividend being safe in the future. Coca-Cola sports a dividend yield of more than 3%, which looks quite attractive compared to the broader market's average of about a 2% yield. Yet at the same time, Coca-Cola's dividend yield isn't so high as to raise concerns about its sustainability going forward. Unlike companies with extremely high yields that later prove to have been too ambitious for their long-term prospects, Coca-Cola has taken a more measured approach toward its dividend, and that has kept payouts from becoming dangerous. Also, the stock has generally stayed with a range of dividend yields between 2.5% and 3.5% over the past several years, and so today's number, while on the high end of the range, is still well within what shareholders are used to seeing. Coca-Cola's current payout ratio is above 150%, which is more than high enough to set off alarm bells. By comparison, Coca-Cola's biggest competitor in the beverage space has a payout ratio of around 65%, which is a good number for a mature company with a solid business that doesn't require a lot of capital investment to sustain. However, one-time factors have inflated the company's payout ratio. Efforts to refranchise bottling activities have led to substantial asset-impairment charges, and restructuring costs have also pushed earnings down slightly. When you adjust for those factors, Coca-Cola's payout ratio returns to a more sustainable level in the 70% to 80% range. That gives the drink giant a margin of safety, albeit a narrow one. Coca-Cola has done a good job of paying dividends to its shareholders. For 55 straight years, the beverage company has made annual increases in its dividend payments, with its most recent 6% boost coming in March. Coca-Cola's dividend growth has been solid and steady, with the company largely avoiding volatility in the pace of its long-term dividend growth. That level of consistency is unusual, even among those companies that qualify as Dividend Aristocrats. 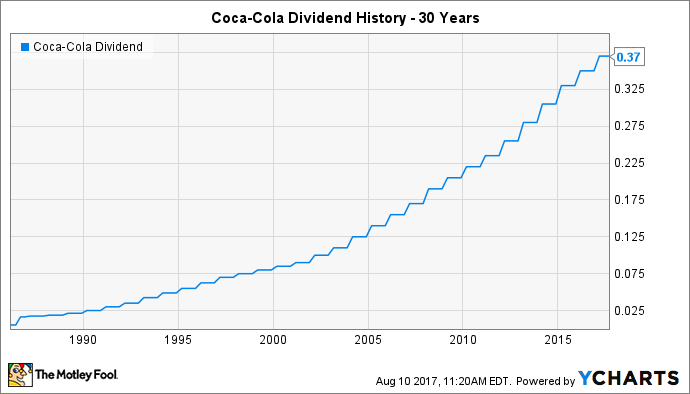 Coca-Cola's ongoing commitment to dividend growth creates an added level of safety that's attractive to investors. Many investors have been dubious about Coca-Cola's ability to keep growing. Consumption of traditional carbonated soft drinks has plunged to levels not seen since the 1980s, and that bodes ill for a company that gets so much of its value from its well-known brand. In order to compete effectively, Coca-Cola will have to tap into more popular beverage segments like bottled water, energy drinks, and sports drinks, and the drink-maker's strategic vision is consistent with that overall game plan. To compete more effectively, Coca-Cola has also moved to divest its bottling operations. This is just the latest in a long-term series of strategic moves that have, at various times, involved integrating bottling under the Coca-Cola corporate umbrella, and at other times, turned around and took bottling out of the beverage giant. By doing so, Coca-Cola aims to improve its margin and free up cash for more growth efforts. By being less capital-intensive, the beverage giant can hopeful respond more quickly to changing trends and avoid getting surprised by shifting consumer preferences. Coca-Cola has managed to grow its dividend for decades, but some will argue that the beverage leader hasn't faced this kind of existential threat before. That doesn't mean that Coca-Cola's dividend is doomed, but it does suggest that investors should watch closely to make sure that the fundamental business underpinnings that have allowed Coca-Cola to boost its dividend payments for so long don't change so much that shareholders are left holding the bag.